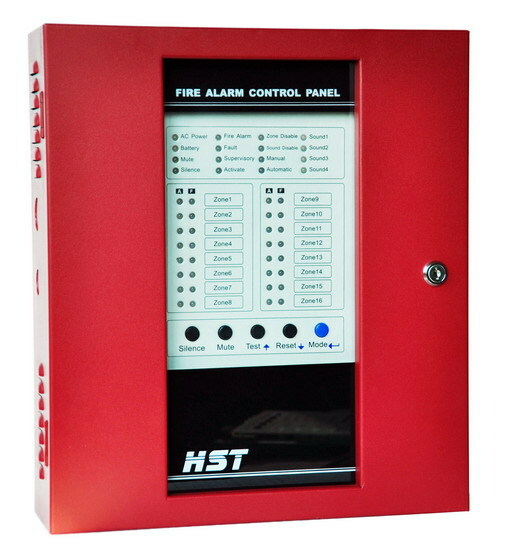 This fire alarm control panel meets NFPA requirement. It should be installed, commissioned and maintained by suitably qualified service personnel. 1. It has 16 zones and 4 sounder outputs. 2. It has 3 standard FORM-A relays contact for alarm, fault, supervisory. And it has EIA-485 port for communication with remote delay and repeater panel. 3. It works with conventional N/O contact input devices including 2 wire, 4 wire smoke detector, heat detector, gas detector and call points etc. 4. It can be programmed by panel keypad. It is supervised all wiring, AC voltage and battery level. 5. It is required to be connected to power earth and it self checks earth fault. 6. Max.20 detectors can be equipped in one zone. Each zone can be disabled separately. 10. Sound 1-4 output can be manual activate directly or disabled. 11. Panel running mode can be switched to manual or automatic. 12. It reports short and broken circuit of zones. 13. It is designed with space of 2 pcs sealed lead-acid backup battery. 14. It is with Test and disable function. 15. CK-1016 fire alarms can connect with Max.32 repeater panels by RS485 port. 2. Wire size: Minimum #14 AWG (2.0mm²) with 600V insulation. 7. Input circuits 1-16 zones may be used as standard fire alarm control panel zones and accpet N/O contact devices.